The small, independently run Cape Town Corner Stores are a dying breed, and those that still exist, do so valiantly and against the odds. 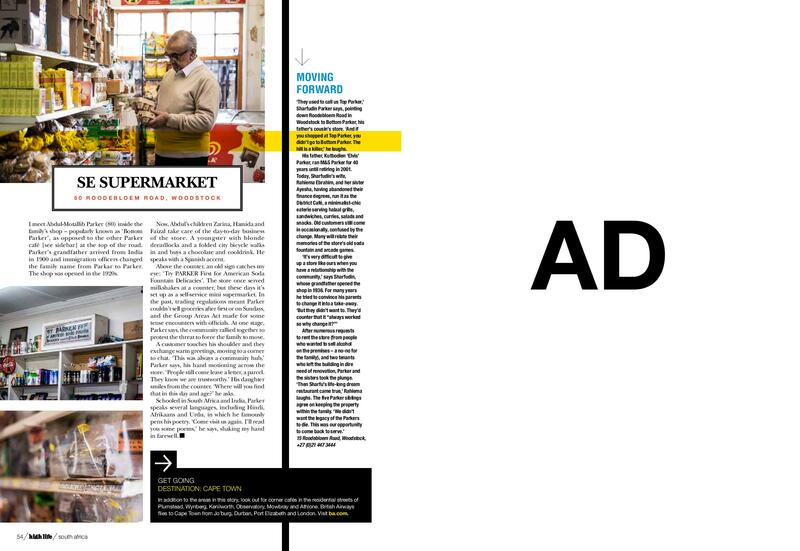 Ishay Govender-Ypma shares the stories of seven local old stores, institutions to their loyal customers. For High Life, British Airways, November 2015. 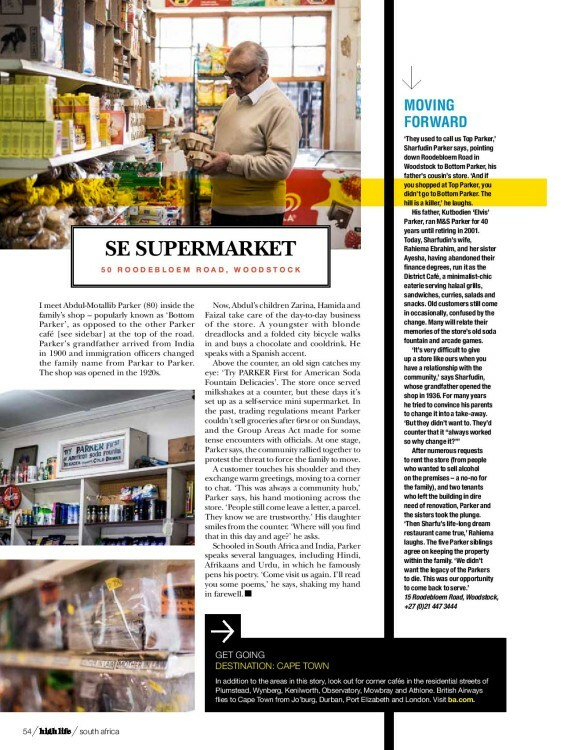 Many of the existing old Cape Town Corner Stores are corner cafés piled floor-to-ceiling with canned goods and cigarettes, time-worn take-away counters selling fresh vetkoek and samoosas, neighbourhood landmarks that peek out of someone’s grandmother’s photo albums, have faced serious challenges over the years. Customers have steadily pulled away since the ‘80s, drawn to the convenience of one-stop shopping at malls with chain stores that offer bulk purchases and negotiated discounts. The children of these family-run businesses, educated from the tills filled by the toil of their parents’ and grandparents’ labour, many of whom were immigrants who arrived in South Africa seeking better lives, or descendants of slaves in some cases, have opted out. A better education has bought them options. Some of the old stores have remained with the same families but taken on new life. Take District Café, in upper Roodebloem Road, Woodstock, for example. Formerly trading as M&S Parker, and maintaining the same corner shop formula for 65 years, the store is now a brightly lit modern restaurant and coffee shop run by two vivacious business graduates. Despite the competition from large supermarkets and the increasing number of buy-outs by foreigners, the changing needs of a community and the threats to safety, there are many old-fashioned shops that have chosen to adhere to the old ways. 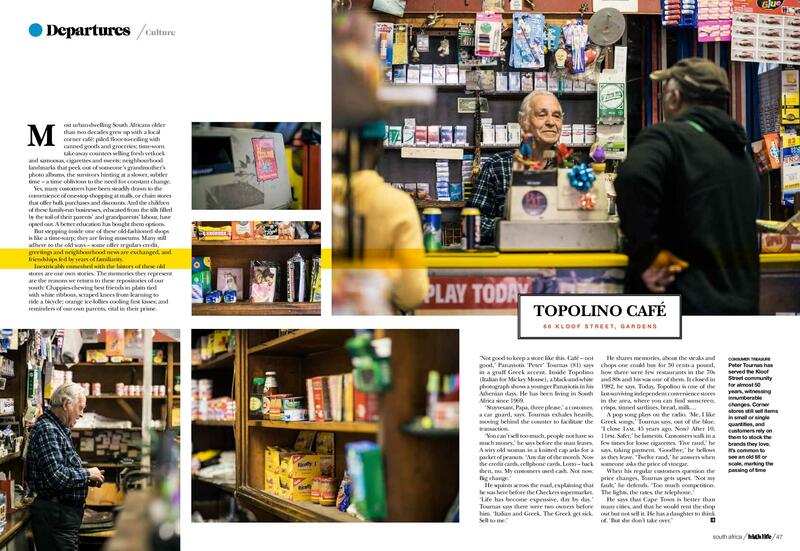 At a handful, like Topolino in Kloof Street, customers ask for a few cigarettes on credit. Greetings are exchanged, friendships fed by years of familiarity. The “regular” is a customer that pops into the store every day and, as the owners share, often several generations – great grandparents, sons, daughters and cousins from one family will pledge fealty to “their” store over others. These are the families that credit is offered to in times of need, without hesitation. 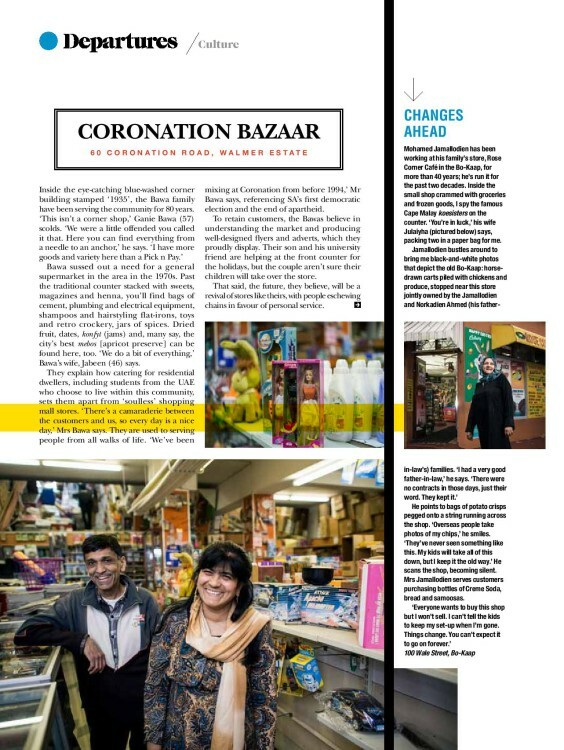 Shop owners like Ganie Bawa of Coronation Bazaar in Walmer Estate and Nelson da Silva of Majestic Café in Muizenberg remain positive that as much as times and tastes have changed, few shops can offer the type of personal service and products their stores do, confident that they have worked for decades to earn the long-standing loyalty and custom from their communities. Inextricably enmeshed with the history of these old stores are our own stories. The memories they represent are reasons we clutch onto the gnarled hands of nostalgia; a patchwork comprised of our own youth: Chappies-chewing best friends in plaits tied with white ribbons, scraped knees from learning to ride a bicycle, orange ice-lollies cooling first kisses, and reminders of our own parents, vital in their prime. Mohamed Jamallodien has been working at his family’s store, Rose Corner Café in the Bo-Kaap for more than 40 years. He’s run it for the past two decades, and isn’t keen for a lengthy natter. 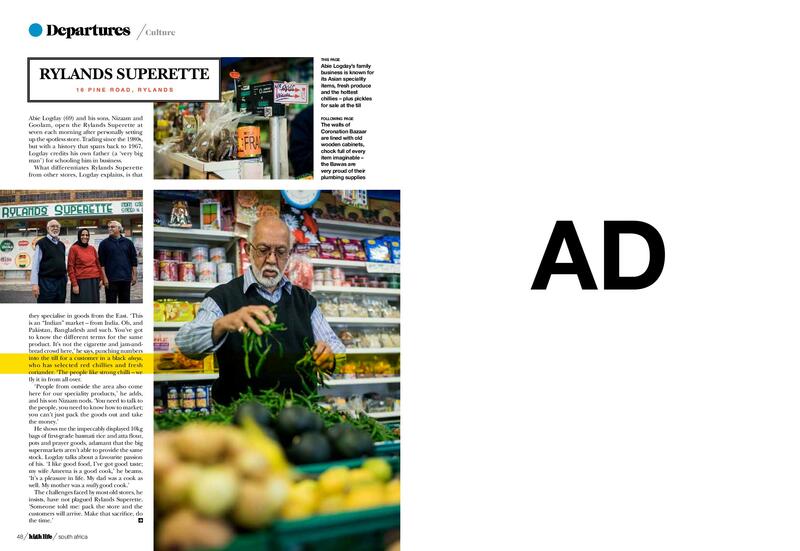 We meet inside the familiar small shop crammed with groceries, frozen goods and the famous koessusters at the counter. “You’re in luck,” his wife Julaiyha says, packing two in a paper bag for me and nodding towards her husband. The Bo-Kaap community, well known for remaining close-knit in spite of changes sweeping through most of central Cape Town, hasn’t been without its challenges Jamallodien says. “Those years only Malays lived here. Now mixed cultures are coming in. It’s not like before,” Jamallodien explains, recalling the days when hundreds of people would attend mosque during the Ramadan fast. Suddenly he points to bags of potato crisps pegged onto a string running across the shop. “Overseas people take photos of my chips,” he smiles with pride. “They’ve never seen something like this. My kids will take all of this down, but I keep it the old way.” He scans the shop, becoming silent. Mrs Jamallodien serves customers purchasing bottles of Cream Soda, bread and samoosas. 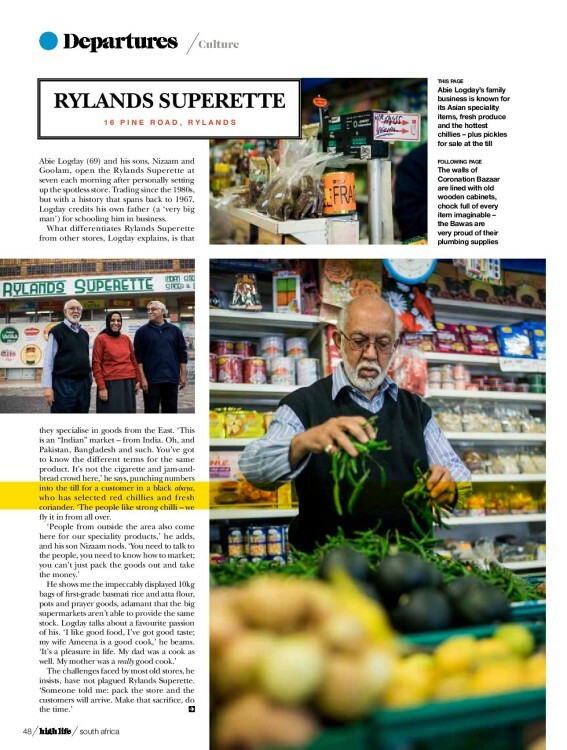 Abie Logday (69) and his sons Nizam and Goolam open the Rylands Superette at seven each morning after personally setting up the spotless store. Trading since the eighties, but with a history that spans back to 1967, Logday credits his own father (a “very big man”) for schooling him in business. “It’s not the cigarette and jam and bread crowd here,” he says punching numbers into the till for customer in a black abaya who’s selected red chillies and fresh coriander. “The people like strong chilli – we fly in from all over,” he says proudly. He shows me the 10-kilogram bags of first grade basmati rice and atta flour, pots and prayer goods, adamant that the big supermarkets aren’t able to provide the same stock. I admire the impeccable displays and Logday talks about a favourite passion. Food, unsurprisingly. “I like good food, I’ve got [a] good taste; my wife Amena is a good cook,” he beams. The challenges faced by most old stores he insists have not plagued Rylands Superette. “They used to call us Top Parker,” Sharfudin Parker tells me, pointing down Roodebloem Road, Woodstock to Bottom Parker, his father’s cousin’s store. “And if you shopped at Top Parker, you didn’t go to Bottom Parker. The hill is a killer,” he laughs. We’re sitting inside the minimalist-design District Café, with his wife Rahiema Ebrahim and her sister Ayesha. This was once the corner store his grandfather had opened in 1936. Parker’s father Kutbodien “Elvis” Parker, a popular Woodstock figure, ran M&S Parker for 40 years until his medical retirement in 2001. Today, the Ebrahim sisters, having abandoned their finance degrees, run District Café that serves halal grills, sandwiches, curries and snacks. Old customers still come in occasionally, confused by the changes. Many will relate their memories of the store’s old soda fountain and arcade games, they say. “I think it’s very difficult to give up a store like ours when you have a relationship with the community,” Parker, a conveyancer adds, describing how he and his siblings grew up behind the counter, taking meals, completing homework and serving customers. “Of the five of us, four have a tertiary education paid for through the shop,” he says. For many years Parker tried to convince his parents to move from grocery and convenience store to a take away. “But they didn’t want to. They’d counter that it “always worked” so why change it.” Getting into debt was always a fear. There was a time, during the height of apartheid, that Kutbodien Parker was forced to sell and repurchase the store from the municipality. “My father was stressed out and angry. All his kids were born in Woodstock and he always served all races and religions,” Parker says. After scrutinising the numerous offers for the store (“we are a halal operation and the sale of liquor and those products was a no-no”), and two tenancies that left the building in dire need of resuscitation, Parker and the sisters took the plunge. “Then Sharfu’s life-long dream restaurant came true,” Rahiema says, and they laugh. The Parker siblings agree on keeping the property within the family. “We didn’t want the legacy of the Parkers to die. This was our one opportunity to come back to serve,” Parker adds. “Not good to keep a store like this. Café. Not good,” Panayiotis (Peter) Tournas (81) says, in a gruff Greek accent. Inside Topolino (Italian for Mickey mouse), in Kloof Street in the city bowl, a black-and-what photo shows a younger Panayiotis in his Athenian days. He has been living in South Africa since 1969. His manner is curt but affable. “Stuyvesant, Papa, three please” a man wearing a car guard vest says. Tournas exhales heavily, moving behind the counter to facilitate the transaction. He squints across the road, explaining that he was here before the Checkers supermarket. He shares memories from Topolino, about the steaks and chops one could buy for 30 cents a pound, how there were few restaurants in the seventies and eighties and his was one of them. The café and coffee shop closed in 1982, he says. Today, Topolino is one of the last convenience stores in the area where you can find sunscreen, crisps, sardines, bread and milk. A pop song flitters on the radio. “Me, I like Greek songs,” Tournas says out of the blue. “I close one am, 45 years ago. Now? After ten. Eleven. Safer. Not now,” he laments. Customers walk in a few times for loose cigarettes. “Five rand,” he says, taking payment. “Goodbye,” he bellows as they leave. “Twelve rand,” he answers when someone asks the price of vinegar. “Too many foreigners. But, that’s political,” Tournas says staring at the counter. “My father always said, ”I’m here to make a living, not a killing,”” Nelson da Silva (43) owner of Majestic Café in Muizenberg, tells me. 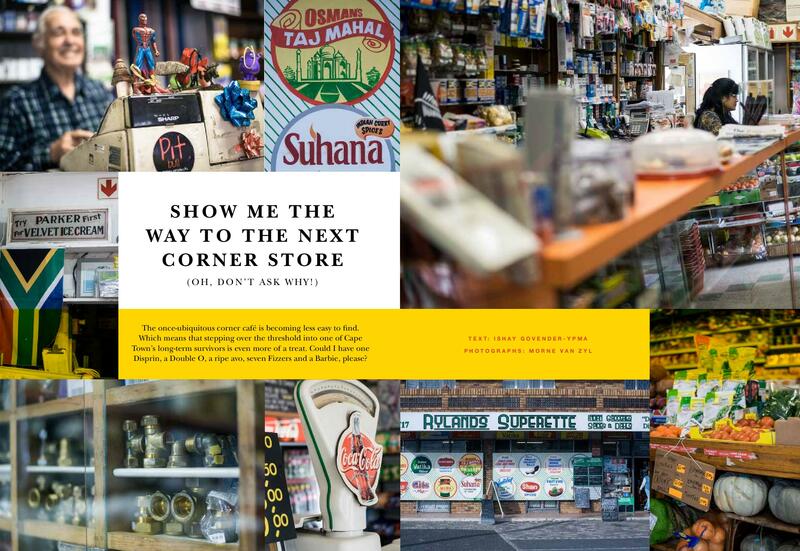 The store he says, which originally opened in 1937 as a café, then a tea lounge, was taken over by his father, the late Mr Jorge da Silva, in 1974. 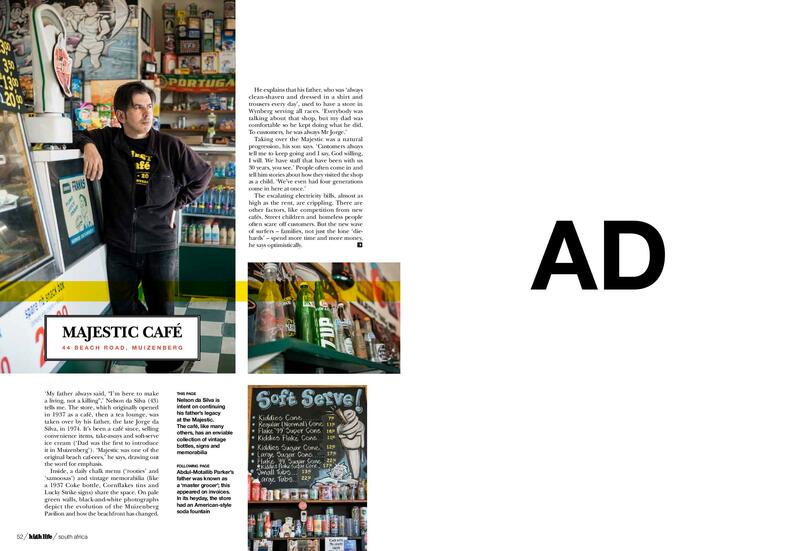 It’s been a café since, selling take-aways, soft-serve ice cream (“Dad was the first to introduce it in Muizenberg”) and convenience items. 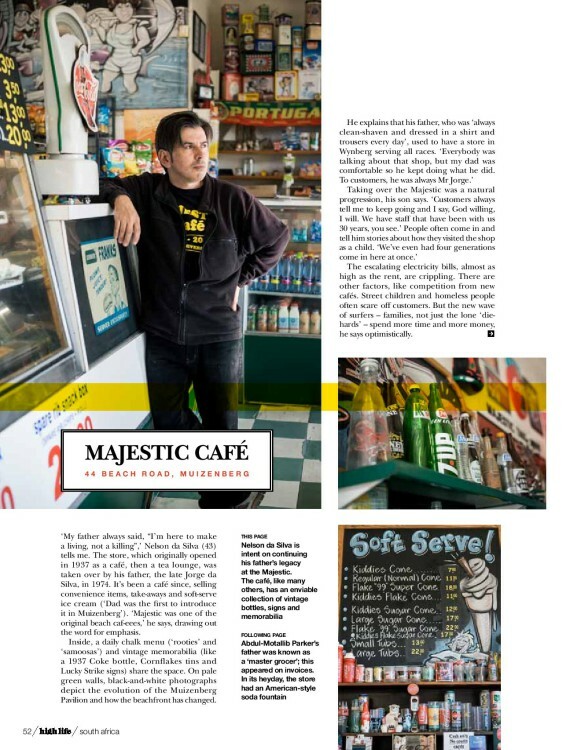 “Majestic was one of the original beach caf-ees,” he says, drawing out the word for emphasis. “I can deal with the rising costs and the competition, but not with the crime. I haven’t seen the councillor here once, and I’m here everyday,” he says. The infiltration of street children and homeless people is a growing problem in Muizenberg, da Silva says, often scaring off customers. The new wave of surfers, however: families, not just the lone “die-hards”, spend more time, and more money in town, he says optimistically. “This isn’t a corner shop,” Ganie Bawa (57) scolds. “We were a little offended you called it that. Here you can find everything from a needle to an anchor,” he explains. “I have more goods and variety here than a Pick n Pay.” Bawa sussed out a need for a general supermarket in the seventies. Past the traditional counter stacked with sweets and henna, you’ll find bags of cement, plumbing and electrical equipment, popular hair shampoos and flat irons. Dried fruit, konfyt and the city’s best mebos, many say, can be found here too. “We do a bit of everything,” Bawa’s wife, Jabeen (46) says. Their son and his university friend are helping at the front counter for the holidays but the couple aren’t sure their children will take over the store. The Bawas tell me about being used to serving customers from all walks of life. “We’ve been mixing at Coronation from before 1994,” Mr Bawa says referencing South Africa’s first democratic election. When we chat about challenges faced, the couple relate the horrifying experience of being held-up by armed robbers at midday. “What really stands out is the support we got from community, it’s amazing. During the fast, people came with food, came to stay with us. Our customers living overseas heard on FaceBook and they sent us messages,” Mrs Bawa explains. 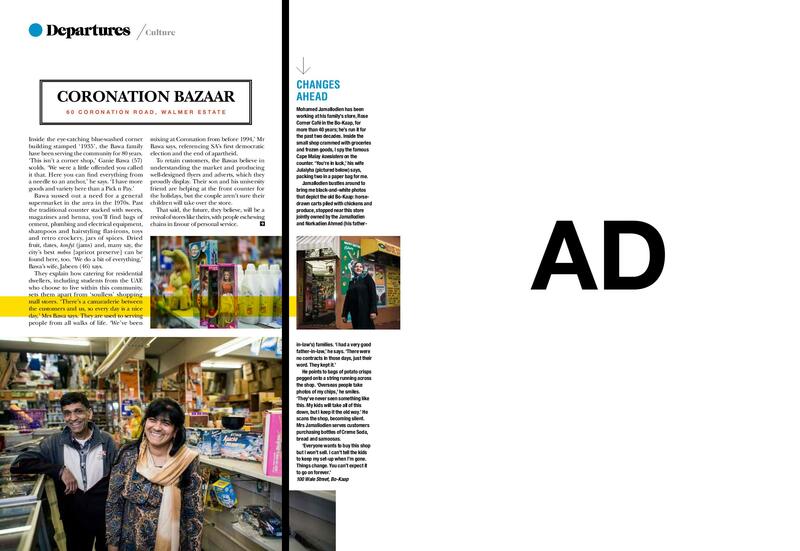 To retain their customers, the Bawas believe in understanding the market and producing well-designed paper advertisements, which they proudly display. The future, they explain, will be a revival of stores like theirs with people eschewing chains in favour of personal service. Mr Abdul-Motallib Parker (80) has been unwell, his daughter Zarina tells me. I meet him inside SE Supermarket, popularly known as “Bottom Parkers”, the other Parker café at the lower end of Roodebloem Road, on the corner of Salisbury Road in Woodstock. Parker’s grandfather arrived from India in 1900 and immigration officers changed the family name from Parkar to Parker. Now, his children Zarina, Hamida and Faizal run the day-to-day business of the store. Youngsters with blonde dreadlocks and a folded city bicycle walk in and buy chocolate and cool drinks, speaking with a Spanish accent. Above the counter, an old sign hangs: “Try PARKER First for VELVET ICE CREAM”. The store, once a café, is set up as a self-service supermarket. In the past, trading regulations meant Parker couldn’t sell groceries after 6pm and on Sundays and the Group Areas Act made for some tense encounters with officials. At one stage, Parker says, the community rallied together to protest if his family was forced to move. In the end, things fizzled over and the store has been in the family since the 1920s. A customer touches his shoulder, and they exchange warm greetings, moving to a corner to chat. It’s a family friend, Parker tells me. “This was always a community hub,” Parker says, his hand motioning across the store. “People still come leave their keys, a letter, a parcel. They know we are trustworthy.” His daughter smiles from the counter. “Where will you find that in this day and age?” he asks. Schooled in South Africa and India, Parker speaks several languages, including Hindi, Afrikaans and Urdu, in which he famously pens his poetry. “Come visit us again, I’ll read you some poems,” he says shaking my hand in farewell.